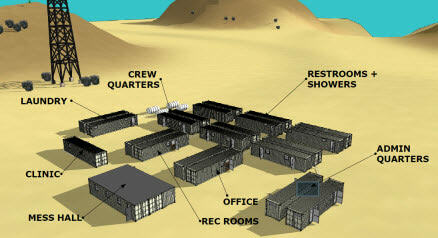 What Facilities Are Needed for an Oil and Gas Work Camp? Housing is a vital consideration for workers in the oil and gas industry. Convenient oilfield housing benefits both workers and energy companies. Why? Because oilfields are often located far from nearby communities; attempting to commute can put a strain on local roads, communities, and energy workers' pockets. Of course, optimal oil and gas housing goes beyond simply giving workers a place to stay. In order to support productivity and reduce employee turnover, workforce camps should feature portable buildings that essentially become a small village—equipped with dining, lodging, recreation, and medical areas. First-aid Clinics - Oil fields are sometimes located hours from the nearest medical facilities, which can make it difficult for workers to get access to medical care in the case of minor illness and injury. First-aid clinics help bridge the care gap. Dining Halls – Hard work requires sufficient fuel. And with energy crews pulling notoriously long shifts, an onsite dining hall is the only way to keep workers nourished, round the clock. Recreation Rooms - Your work camp should also present opportunities for workers to socialize and relax. A recreation room can be tailored to fit your preferences and needs; it may include game tables, televisions, or a computer room. Offices – Site managers need a place to complete deskwork and computer-aided reporting. Offices and IT control rooms allow you to keep up with day-to-day business, as well as maintain online communication.